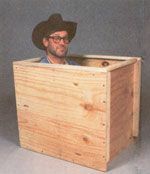 As my tiny house construction progresses, I have new sections of it to tackle - both design-wise and self educating. Some portions are easier than others; I was familiar with framing, so that was easy. Insulation I'd done before (traditionally and on another tiny house) so that was easy. And the windows - that has been the biggest challenge to date. Holy smokes who knew there was so much to learn? Next came the front door. Design, and hardware. I've got those figured out for the most part. And now I'm facing some portions that are more daunting to me: Plumbing and electrical. Plumbing seems like the most difficult, specifically those pesky reservoir tanks. Where do they go? How large should they be? How and why do you access them? The actual running of pipes doesn't seem scary. And then there is the water pump, and the filters, and the tankless water heater... those? A wee bit more challenging. But before I get to plumbing, I must address bathroom design. The toilet I've mostly figured out; I wrote about the various options here and I've decided to go with the bucket and sawdust as written about in the Humanure Handbook. I may or may not add a Separett Privy Kit to the set up later. So that leaves a sink, some bathroom storage and the actual shower design. I started looking at the standard bathroom design for the Gifford, and the shower area is 24" x 24". I'm not sure that I can wash my hair in that much space without hitting my elbows on the walls, and I'm positive that I'd have to be a contortionist to shave my legs in that space! To remedy that I've decided to make my bath a wet bath - you know, like on boats, where the whole room becomes the shower. I'll need to figure out a way to cover the toilet and storage, and I'll have a curtain that pulls over the window to protect it from water. The door may or may not be waterproof - depends what it is made out of. I've started researching what materials I could use for the floors. 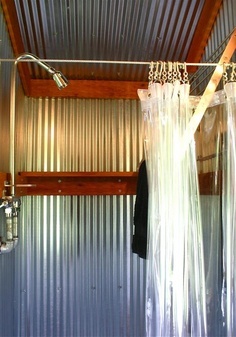 I like the look of galvanized metal, and I found one couple that built their own. They wrote a step by step instruction of how they did it, and you can read that here. I am less excited about having metal on the floor in the shower - doesn't it seem like it would be freezing on your feet in the winter? But I could put down my teak bath mat and that would solve that issue. And I do have a couple of friends who do commercial metal working, so I think a design could be within reach. And here is another idea: DIY Wetroom. This kit gives you the option of a tile floor (won't work for me - the tiles will probably crack as I travel) or a vinyl floor, both of which can get wet. I haven't researched those in detail yet, but pretty soon I'll be digging into the details. I have a feeling I am going to be in a RV supply store before it's all over. Or maybe a nautical supply - that sounds more fun. Haha, I'm needing to learn the same things about bathrooms and plumbing right now! Good point about tile potentially cracking -- I've been thinking of having a mostly tile floor,but never thought about that issue. I'm going to check around with some other tiny housers and see if any of them have gone that route/had that problem. Awesome post! I found also helpful tips on how to repair on plumbing problem. This website is the best plumbing services sydney.Hope this will help you dear readers!